The video is too large so I’m having difficulties getting full screen high def quality. If you hit play without maximizing the screen, it will look fine. If you maximize the video, it will look compressed and the video quality will suffer. Anyway, here are the results from “The Quest”. I hope you enjoy it. Make sure to watch the ending…. Between A Snapshot & VanGogh: A Systematic Approach to the Vast Spectrum of Photography. My objective on this day was to photograph whitetail fawns. While I happened to see a few, they were not hanging around in the open long enough for any decent shots. 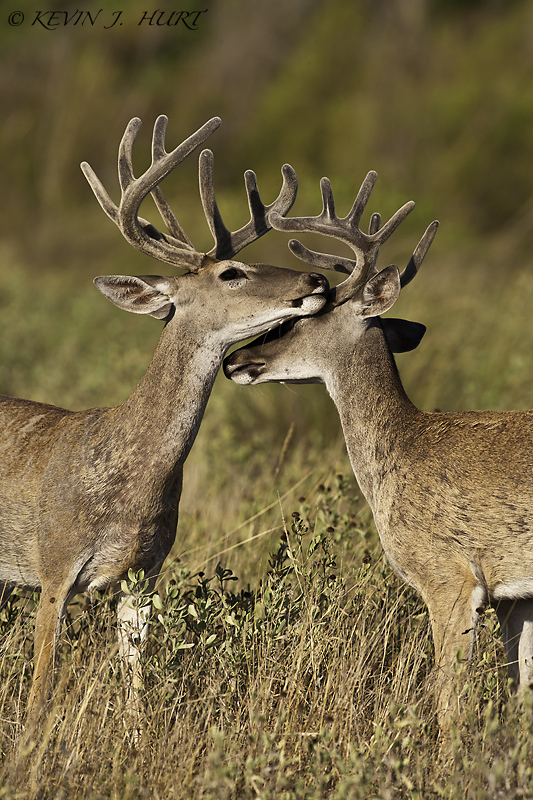 So, I turned my attention to the images that were presenting themselves…bucks in velvet. There were quite a few big bucks and I have other portraits of them that I will share on this blog at a later date. However, I also like to capture behavioral shots whenever I get the chance. The image highlighted here is that of two bucks browsing on corn I had put out for them to eat. As they approached each other I anticipated they might raise on their hind legs and swat at each other with their front hooves as I had seen this type of behavior several times this morning. So, I flipped the camera to vertical and waited. The spat never came but this interaction did. What I like about this image is that the viewer’s interpretation of the behavior can vary based upon what they see. Is this a friendly encounter or a sign of a battle that is to come later in December?